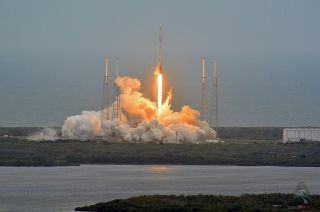 SpaceX's Dragon 9 cargo capsule blasted off to the International Space Station at Cape Canaveral on April 18, 2014. SpaceX's audacious plan to return a rocket to Earth after a space launch today (April 18) may not have gone perfectly, but the company's founder still considers it a success — one that could help lay the foundation for fully reusable rockets in the future. SpaceX tried to guide the first stage of its Falcon 9 rocket back to Earth in an ocean splashdown today during the launch of the company's unmanned Dragon cargo capsule toward the International Space Station. It's still unclear if the rocket stage — outfitted with landing legs — touched down softly as hoped, but billionaire SpaceX founder Elon Musk thinks the odds aren't good. Still, there were some notable successes regardless of what ultimately happened to the rocket stage. "I would consider it a success in the sense that we were able to control the boost stage to a zero roll rate, which is previously what has destroyed the stage — an uncontrolled roll," Musk said. One day, SpaceX hopes to land rocket stages back on Earth in order to use them again on other spaceflights. Reusable rockets have the potential to save a lot of money for spaceflight companies and space agencies in the future, experts say. Standard Falcon 9 rocket launches cost somewhere between $50 million and $60 million now, according to the SpaceX website. However, Musk said in 2011 that a reusable rocket program could reduce capital costs of the rocket to $50,000 if it is reused 1,000 times. Today's reusability test could help make that dream a reality, Musk said today. "Even though we probably won't get the stage back, I think we're really starting to connect the dots of what's needed," he said. "There are just only a few more steps that need to be there to have it all work. I think that we've got a decent chance of bringing a stage back this year, which would be wonderful. I think what we've done thus far is evolutionary improvements, but that holds the potential for something more significant." Earlier SpaceX attempts to bring a rocket stage back to Earth in a controlled fashion failed because the rocket's thrusters were unable to overcome its rolling, Musk said. This time, however, the SpaceX team added more powerful thrusters and more propellant to try to handle that problem, and it seems to have worked somewhat. The Falcon 9's re-entry burn went well, and when the last data came in, the rocket wasn't rolling much at all, according to Musk. A SpaceX plane was also collecting data as the rocket stage made its way back toward Earth. Once that data comes in, SpaceX representatives will have a better sense of what happened with the test. This launch also helped SpaceX engineers and representatives demonstrate that the landing legs attached to the Falcon 9 didn't have any negative impact during the ascent phase of the flight, Musk said. Dragon's mission, meanwhile, is going according to plan. The cargo capsule is expected to arrive at the space station at 7:14 a.m. EDT (1114 GMT) Sunday (April 20); you can watch the docking live on Space.com via NASA TV. SpaceX holds a $1.6 billion contract with NASA to fly 12 cargo missions to the International Space Station using the company's Falcon 9 rocket and Dragon capsule. Today's launch marks the third official supply run under that contract.